Baby Corn Rava Fries are tasty fritters. The baby corns are given a good coating of rice based masala and then rolled in rava (semolina) and finally deep fried. Hence it is called rava fries. The rava coating makes the fritters very crispy. I got this recipe from a FB group. Generally in Coastal Karnataka this method is followed to fry the fishes. The baby corns are very commonly used in Asain cuisines. Baby corn is a favorite of ours. Unfortunately it is not available in the place where we stay. This recipe was with me since a long time. I was waiting to get baby corns, so that I can try making it and share the recipe as well. A good friend of ours got us these cuties and I was very happy. I tried making it for the first time and it tasted awesome. It is little time consuming as the baby corns are delicate. But I assure its worth all your efforts. Wash the baby corn and pat it dry using a cloth or paper towel. 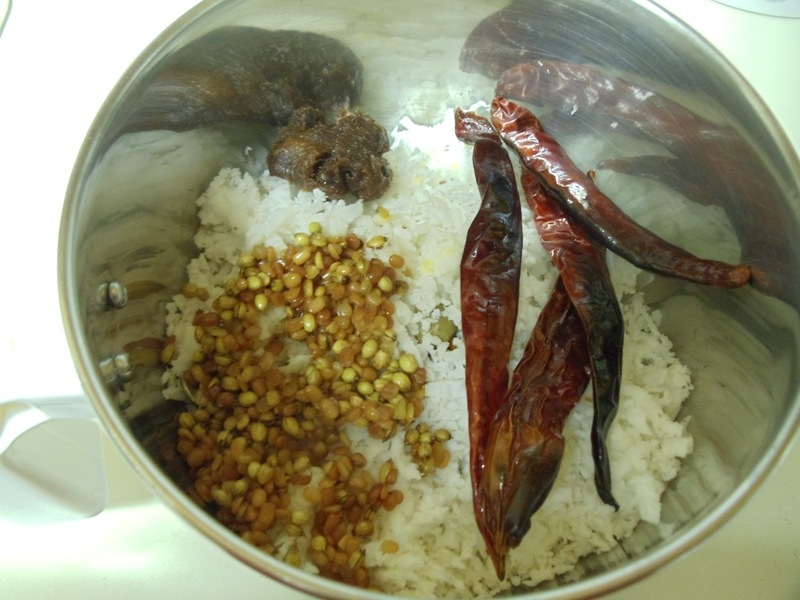 To prepare masala: Wash the rice and grind it along with red chillies, coriander seeds, asafetida, tamarind, turmeric powder and salt, to get a fine paste. Add very little water while grinding. The final paste should be smooth and thick. Now transfer this thick paste to a large mixing bowl. Start coating all the baby corns evenly. All the baby corns should have a good coating (be careful while coating as the baby corns are very delicate and there are chances that it will break). Spread few tablespoons of semolina on a plate and then roll the masala coated baby corns one by one, to get a even coating. Now deep fry these rava coated masala baby corns, until they turn golden brown. Once done, transfer them on a paper towel, to drain excess oil. Baby Corn Rava Fries are ready!! Serve them hot. Above measurement serves 2-3 people. (Note that you can use any cup for measurement. The amount of oats, rava, curd are equal while the amount of water is double (the amount of water required may depend on the thickness of the curd. So add it accordingly, as required). Vary the amount of salt and eno accordingly). Dry roast the oats for 2-3 minutes or until you get a nice aroma. Then allow it to cool. Then grind it to make a coarse powder. Now take a mixing bowl. Add the coarse powder of oats, semolina, salt and curd. Mix well. Then add water. Allow it to sit for 15-20 minutes. The final consistency of the batter should be thick, but of pouring consistency. Meanwhile grease the idli moulds using oil. When the batter is ready, then add eno and mix it well. You will see that the batter starts to rise. Pour the batter in the idli mould. Then steam them in a steamer or pressure cooker (without whistle) for 15 minutes. Then allow it to cool for 2-3 minutes. Oats- Rava Idli is ready!! Serve it hot with coconut chutney, sambhar or any other side dish of your choice. I served it with Pudina Chutney. Above measurement makes 12 medium sized idlis.